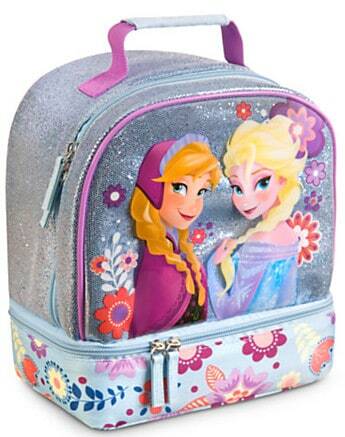 Frozen Lunch Bag with Anna and Elsa is Back in Stock! I get emails nearly every day asking where to find the Frozen Lunch Bag I wrote about several months ago. I've checked on it frequently and it's been out of stock for a very long time. I had no idea a Disney Frozen lunch tote would be so popular! If you've had your sights set on an authentic Disney Store Frozen Lunch Bag, I have news for you: This Frozen Lunch Bag is in stock right now. It's not the same one that was offered back in January, but I think this one is even cuter than the first! The Frozen Lunch Tote is $14.95. Shipping is free on orders of $75 or more when you use DisneyStore.com promo code SHIPMAGIC. Anna and Elsa screen art on clear outer layer, with glittering blue background layer. Glittering blue sides and back. Zip main compartment with two pulls. Interior mesh compartment with ID label. Accessory loop attaches easily to the Frozen Backpack. Part of the Frozen Gear Up Collection. I'm also pretty excited about a matching item. 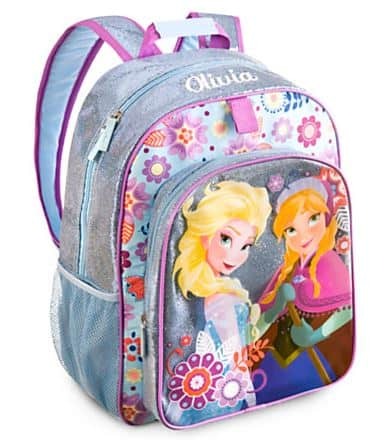 Right now there's an adorable Disney Frozen backpack that matches the lunch tote. 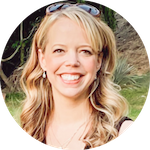 It can even be personalized for just $1 for a limited time when you follow the instructions found here!